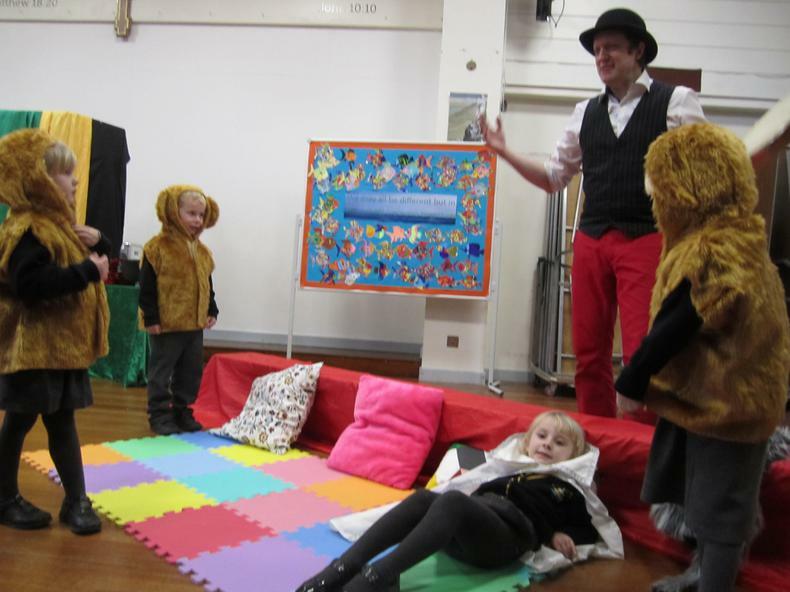 Today we had a drama workshop doing the stories of "The three little pigs" and "Goldilocks and the Three Bears" - all the children loved it and all the children were eager to volunteer and join in. 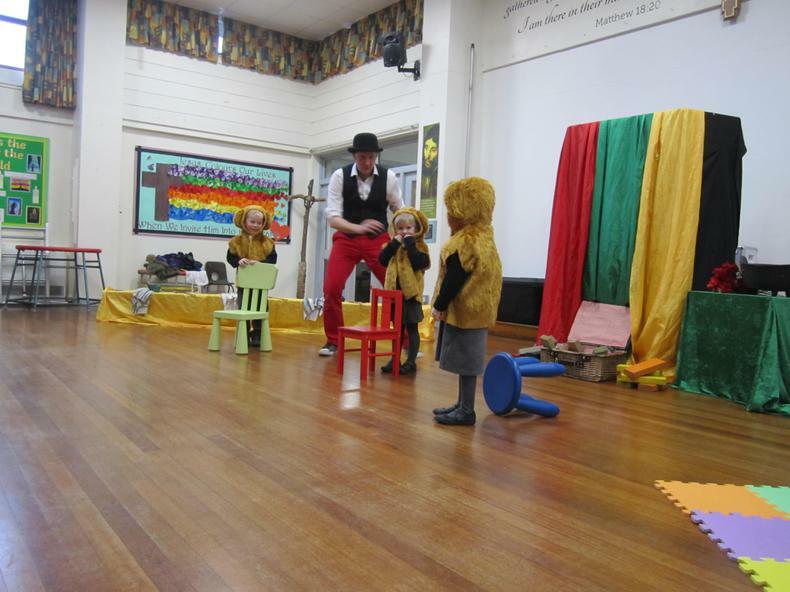 We started the workshop with Goldilocks - and very soon there was Goldilocks trying out the porridge. "Nice, nice, nice!" she said all on her own. 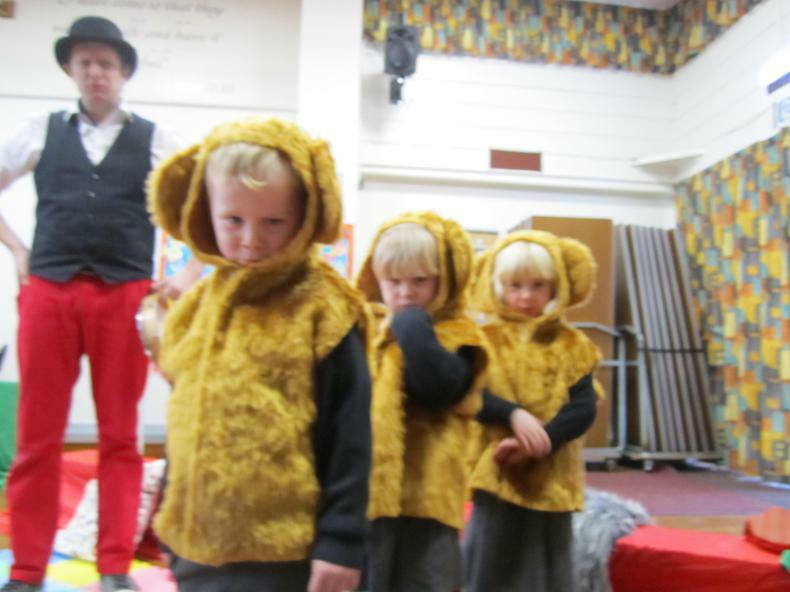 Very soon the 3 bears arrived - and they had to inspect just what happened in their cottage! And soon they were acting out the whole story! 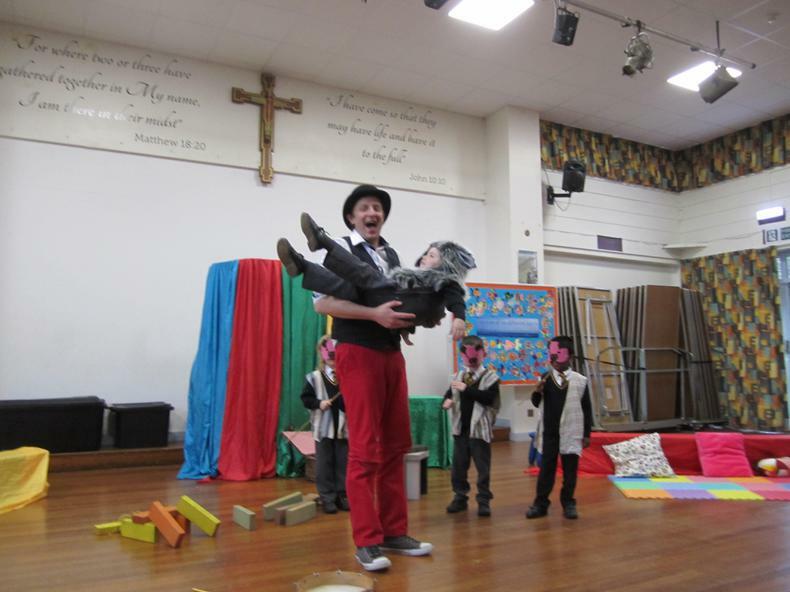 Then the children helped act out the story of "The 3 little pigs" - and this was very funny! First of all we needed the three little pigs and they met a man who sold them all they needed to make their houses. 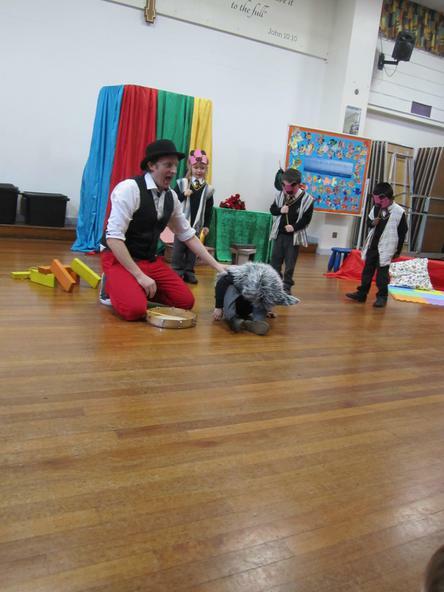 But who should happen to come along but the big bad wolf. He was (just a little bit) big, he was (just a little bit) bad, and he was definitely very funny! Look out! here he is and he is bearing his teeth - wow he is really scary! 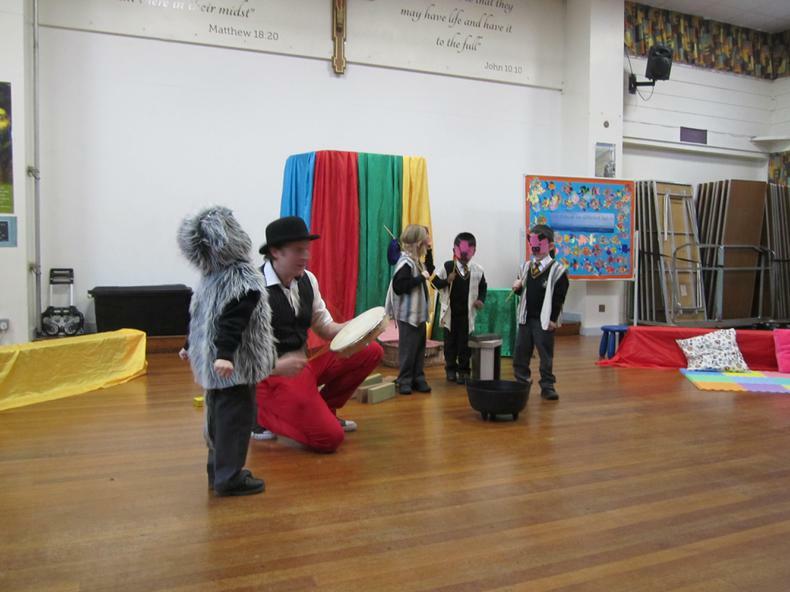 It wasn't long before the big bad wolf was huffing and puffing and trying to get those pigs, but of course in the end he finally fell in the cooking pot - but not without giving us an almighty howl first - that wolf was not going to be easily beaten! Once we got back to the classroom the children were eager to get cracking, and had a busy day drawing and writing, painting pictures of the stories we'd seen and making some amazing models of the the three little pigs houses. There are the three little pigs in Archie's picture with their houses. 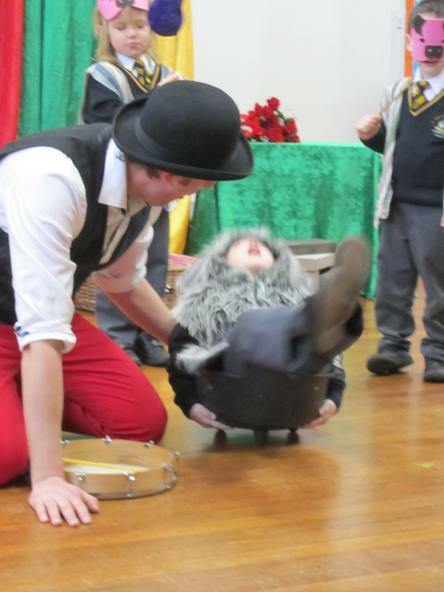 Oh dear - the wolf has got food all down his tummy - it's lemonade and dinner says Archie!